Unique to ResMed’s AirTouch F20, our new UltraSoft memory foam cushion adapts to your patients’ facial profile. This, for a light and gentle experience of sleep therapy. Foam has unique properties that provide less friction and contact pressure than a standard silicone cushion —even when it’s sealed firmly against your patient’s face. This reduces the likelihood of red facial marks. A gradual but uncompromising seal. The light and supple foam cushion gradually adapts to a patient’s face to seal securely and prevent leaks during therapy. And because foam is permeable, it allows a very small amount of air to pass through the cushion – providing a more natural sleeping experience without compromising therapy. AirTouch F20 is made with interchangeable components that allow you to easily mix and match them with AirFit F20 mask. AirTouch F20 cushions are also compatible with AirFit F20 for Her masks, so female patients can enjoy the comfort of UltraSoft foam alongside the outstanding fit of a female-specific mask. 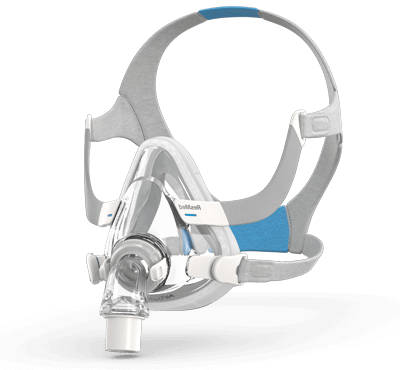 ResMed AirTouch™ F20 comes with the QuietAir™ diffuser vent, making it our quietest mask ever.